For any Stamping Bella fans out there, Em has done it again and released some new cutie patootie stamps. Will look at more later! Love em, so far!!!! Going to check them out right now!! They are KEWL...I like simple not fussy deigns! So Jennifer, will you be carrying any of these? THEY ARE CUTE!!! never heard of them before. they have some super cute stuff! i'm like Holly, i don't like 'fussy' stuff so these are great. Robin G wrote: So Jennifer, will you be carrying any of these? THEY ARE CUTE!!! I can't carry them....Em is great but she doesn't sell to other online stores. But I do have lots to stamp out if there are any you like! That is cute eh Sarah? That unfortuantely I cannot stamp out for you! I was eyeing that a ton after seeing it in the Last Mag I got and then read the darn thing is only 8 x 8....changed my mind after I realized it was sooo tiny! I have a tool box thingy kind of like that for alot oov my embellies...I will take a pick later to show you! 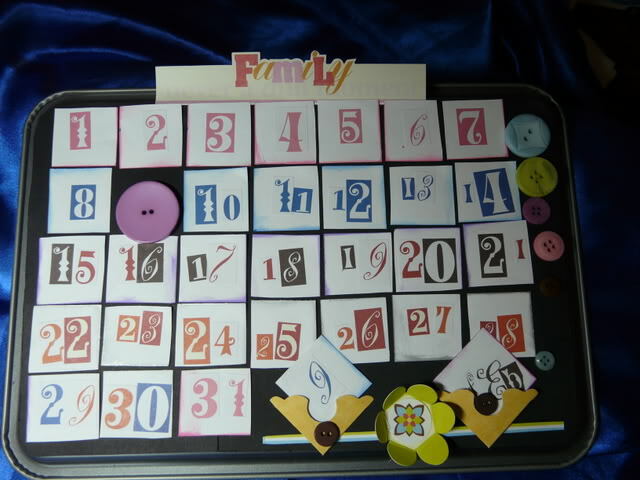 There are alot of easier ways to make advent calenders...that I have seen. I have seen them out of cookie pans whichh are cute! I am actually teaching a ADVENT calendar cookie sheet CLASS in November!!!! It is started but on the back burner because of 1st of month obligations! oh wonderful. I did a challenge on an other forum using a baking pan[VickiR] and it was a yearly calendar with date and months etc it was awesome I still have photos I think Dawn did this to with me !!? Oh Rose please share with us all! Oh My Gosh, these are 2 CUTE!!! I really want to make some now for gifts (family). I could send one to our nieces (7, 5) they would have fun with it, don't you think? And my MIL might think it's a cute decoration too! Thanks for the links Jennifer! Holly and Rose, I would love to see your pictures!! You know mybe I will make one of my own this year....A tinfoil cookie sheet would be cool too as you could use your crop a dile or big gite to put holes in that too! Wow, my mind is just a whirling right now! this was it ,rofl!1 now I need to look at it to work out what we had to do!